The much controversial subject of spiritual interaction has been engaging the attention of the majority of thinking people since time immemorial. 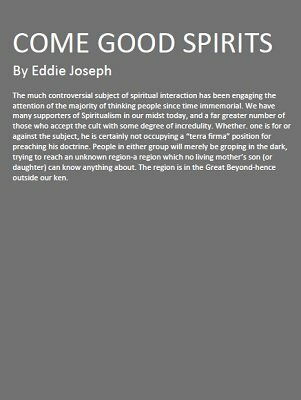 We have many supporters of Spiritualism in our midst today, and a far greater number of those who accept the cult with some degree of incredulity. Whether one is for or against the subject, he is certainly not occupying a "terra firma" position for preaching his doctrine. People in either group will merely be groping in the dark, trying to reach an unknown region-a region which no living mother's son (or daughter) can know anything about. The region is in the Great Beyond - hence outside our ken.